It’s not a surprise that we heard the news from Samsung home country that rugged version of their Galaxy S4 smartphone, Galaxy S4 active receives a Snapdragon 800 CPU update. Samsung already did it with Galaxy S4 and Galaxy Note 3. 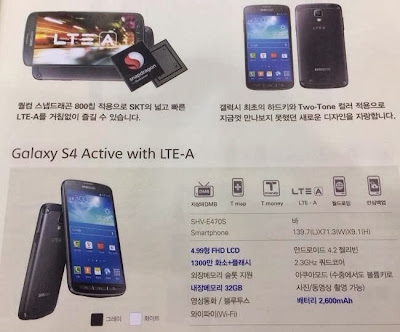 The Galaxy S3 Active LTE-A is now included in the SK-Telecom lineup. Alongside the updated SoC with 2.3GHz quad-core CPU and Adreno 330 GPU, the newcomer sports an updated, 13MP camera and a new color scheme white. Original Galaxy S4 active had a 8MP snapper on the back. The LTE-A equipped device has also shed a few grams compared to the I9295 (147g compared to 151g). The rest of the SK-Telecom’s Samsung Galaxy S4 Active specs are the same as those of the Snapdragon 600 version. Highlights include a 5” 1080p display, 2,600mAh battery, and IP67 certification. There’s no word on international availability of the updated Samsung Galaxy S4 Active. But keep your fingers crossed. After all we are talking about Samsung here.